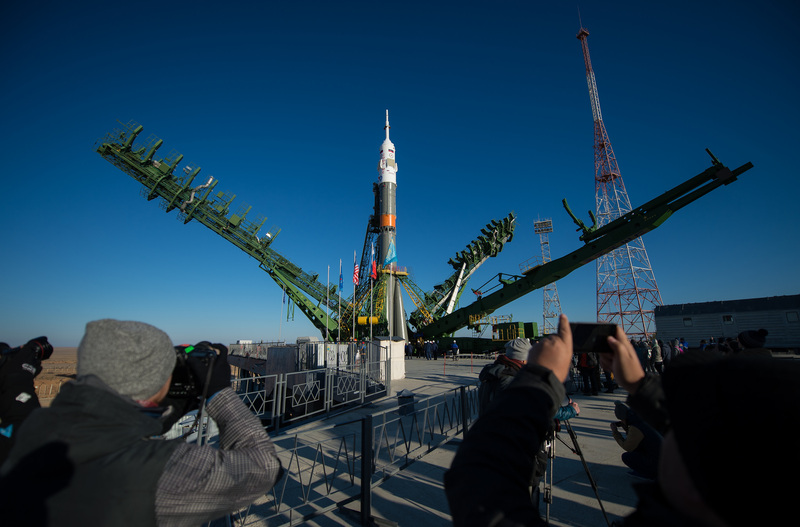 First-time Soyuz Commander Sergei Ryzhikov, experienced Flight Engineer Andrei Borisenko and NASA Astronaut Shane Kimbrough are aiming for blastoff at 8:05 UTC on Wednesday to begin a two-day commute to the Space Station aboard their Soyuz MS-02 spacecraft – coming back from a four-week launch delay caused by a technical issue on the Soyuz. 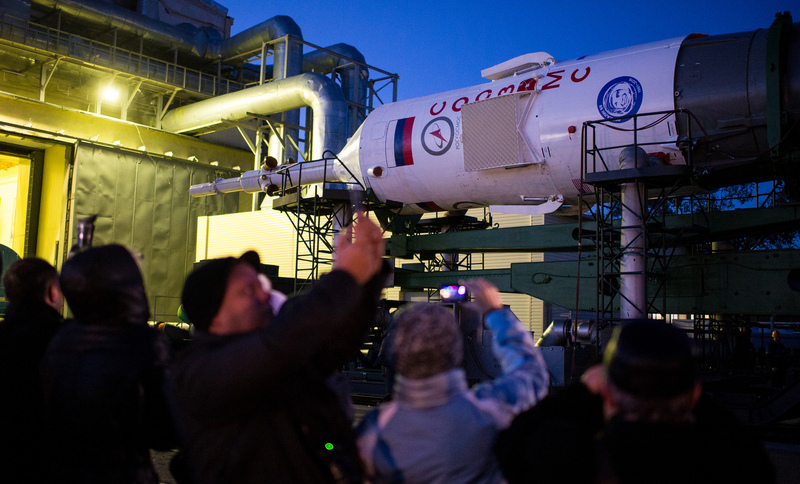 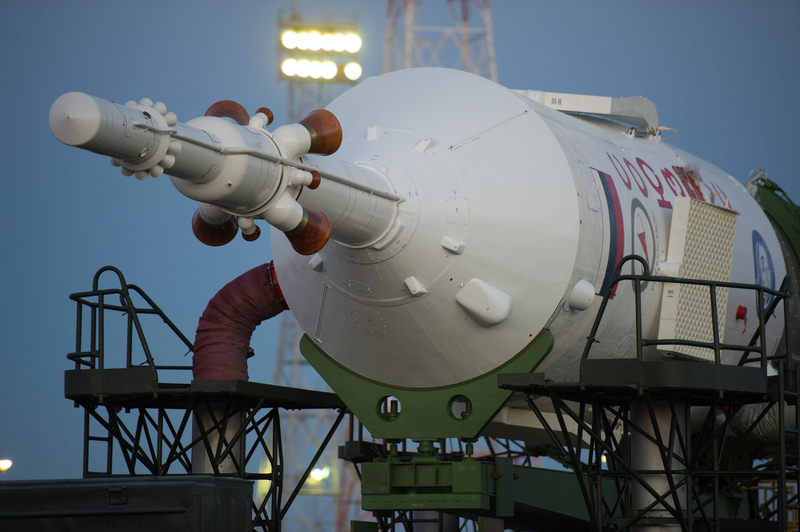 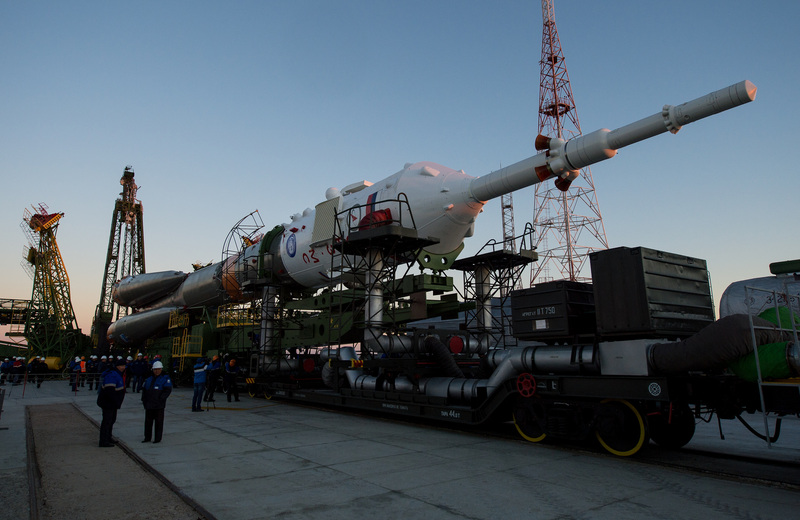 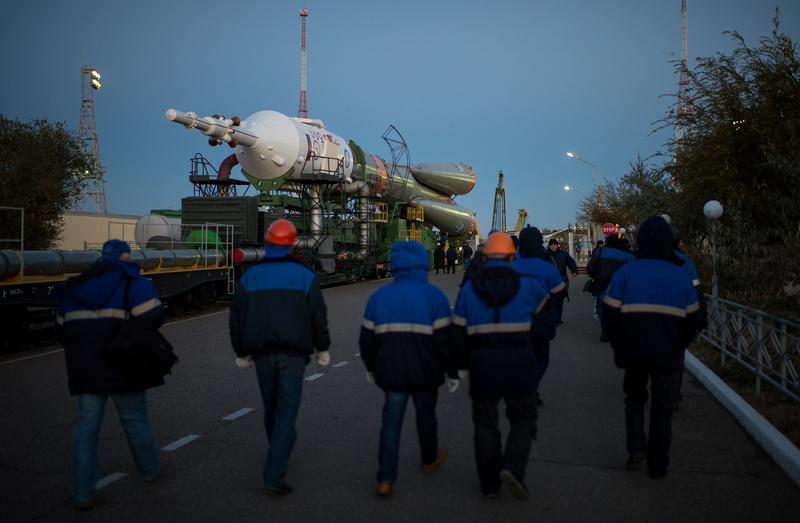 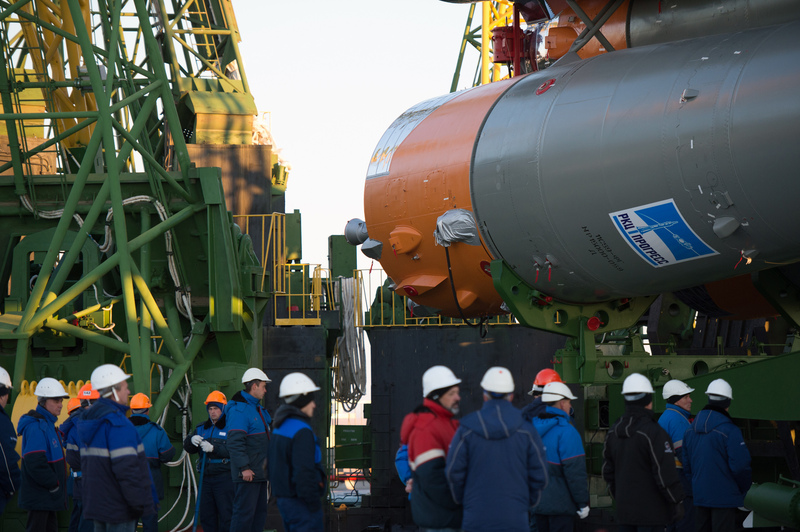 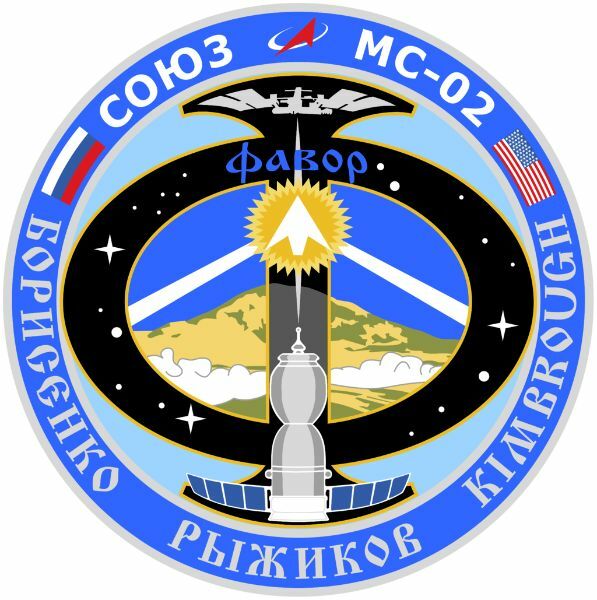 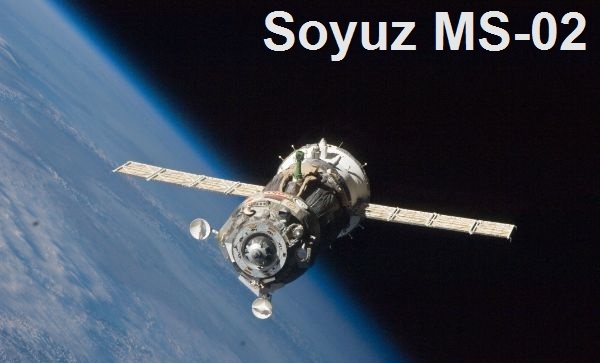 Soyuz FG finished assembly on Friday and emerged from its MIK Integration Facility at the traditional early morning hour on Sunday. 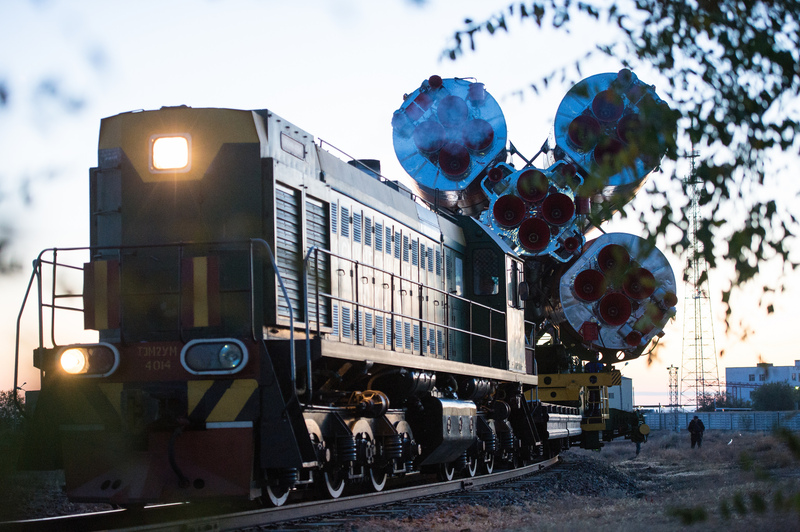 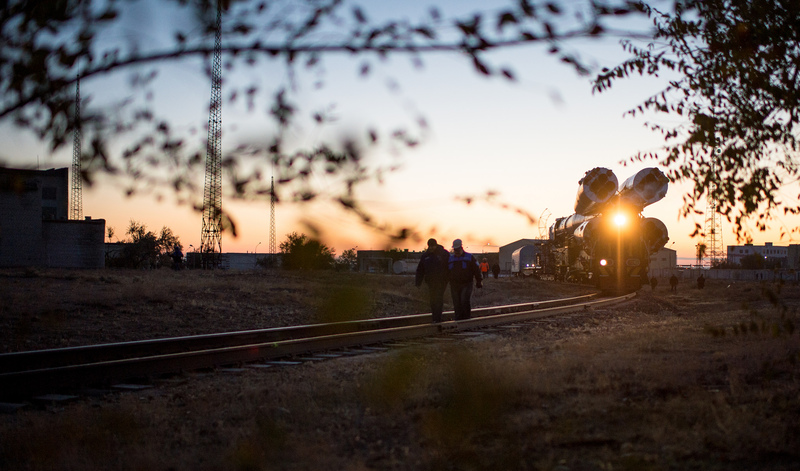 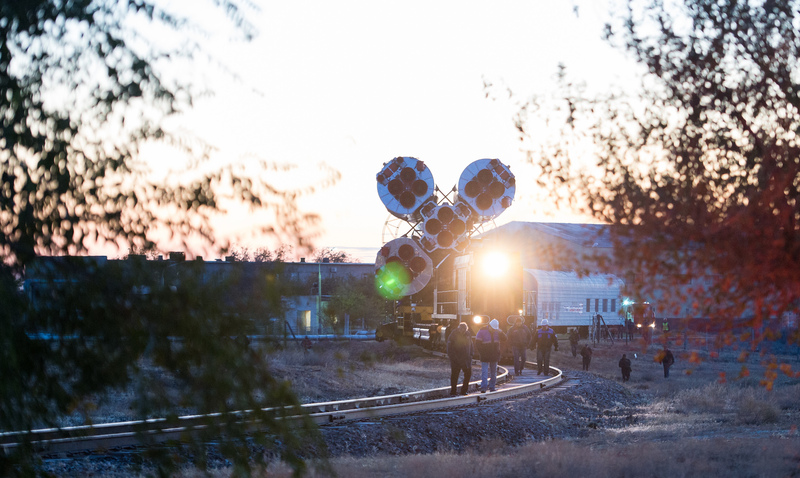 It was a cold fall morning at the storied Cosmodrome but spectators were treated to clear skies and a colorful sunrise while the 49.5-meter tall Soyuz FG made its slow trip to the Site 31/6 launch pad. 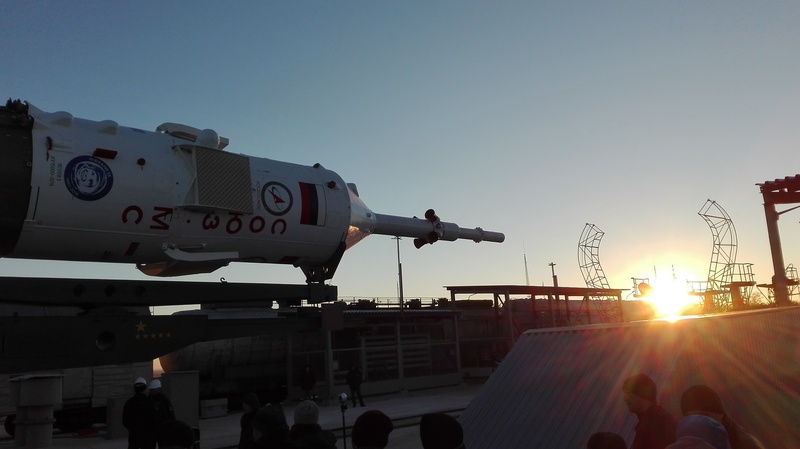 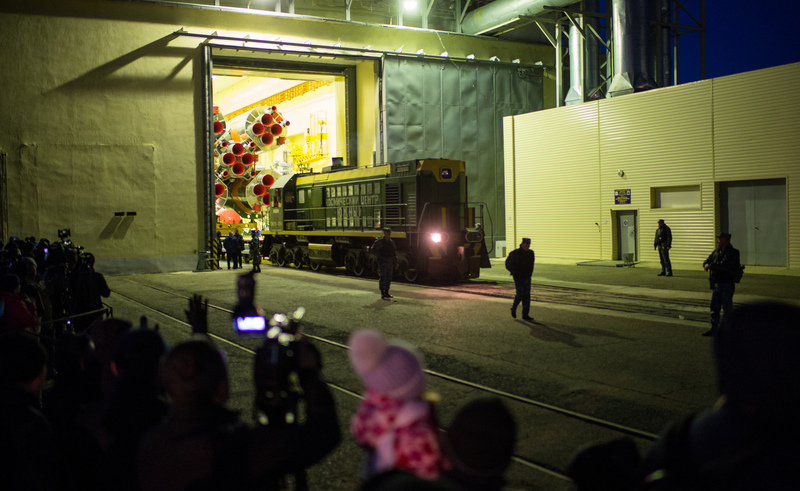 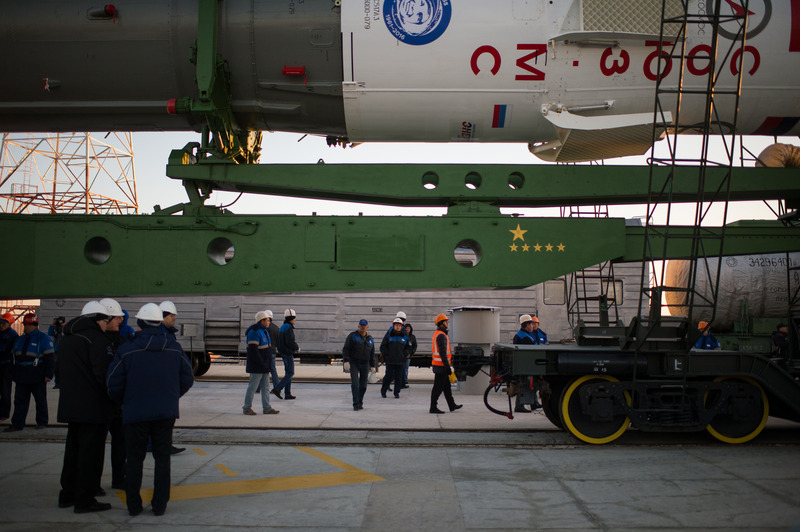 The early morning rollout of the launch vehicle dates back to Yuri Gagarin’s Vostock in 1961 and many aspects of the crew’s launch preparation are set up to closely resemble the events of the historic one-orbit mission over five decades ago. 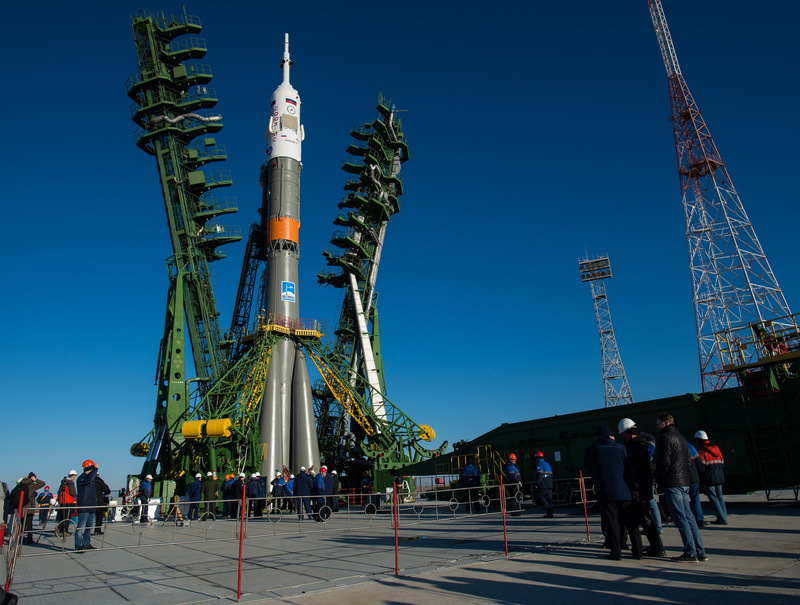 The Soyuz MS-02 mission as well as the subsequent flight will be using the launch pad at Site 31/6 instead of Gagarin’s Site 1/5 launch pad that is currently unavailable due to ongoing refurbishing and outfitting work. 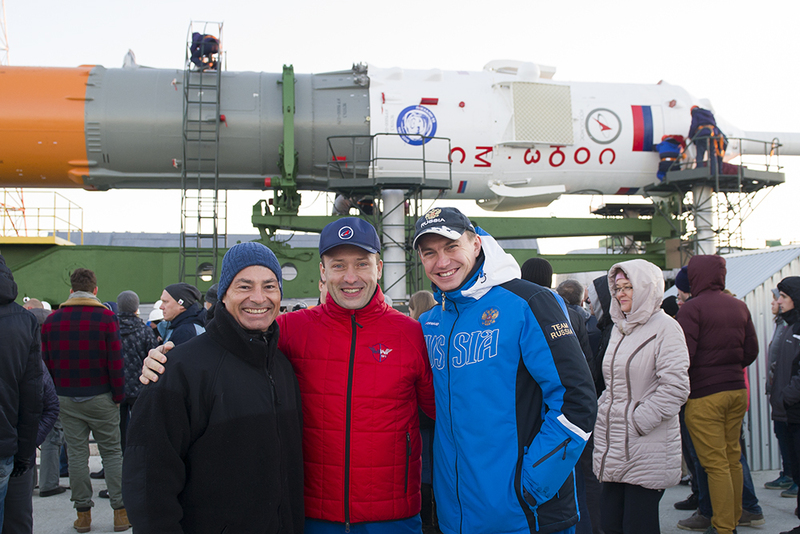 The Soyuz MS-02 prime crew did not attend Sunday’s rollout, as is tradition since it is considered to bring bad luck. Backup crew members Aleksandr Misurkin, Nikolai Tikhonov and Mark Vande Hei were present for the rollout and watched Soyuz pull up to the on-ramp to space. 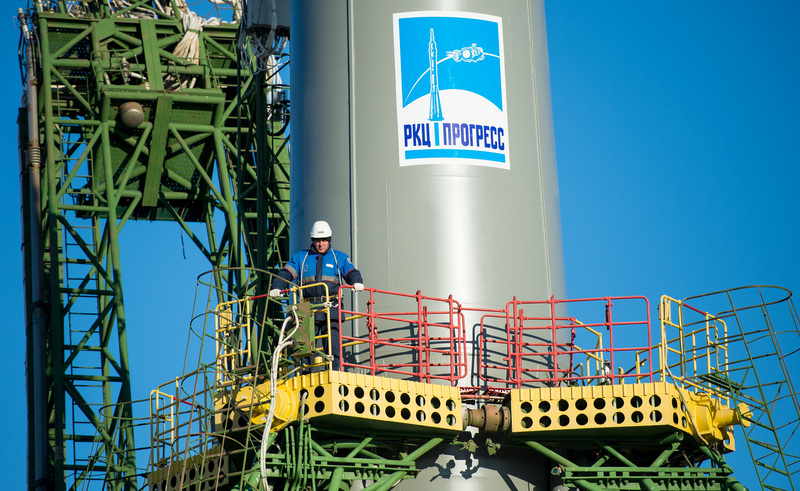 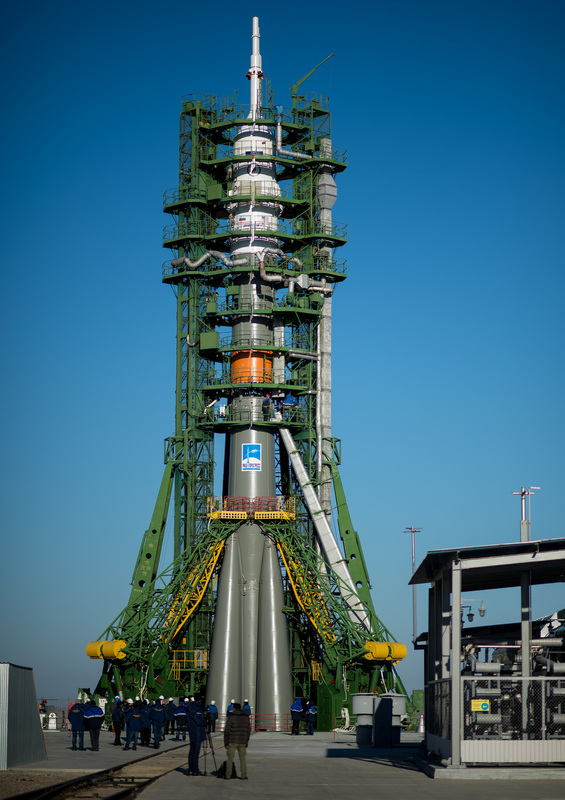 Arriving at the launch pad, Soyuz was carefully raised to a vertical position and secured atop the pad before the Umbilical Masts were moved up to the vehicle and the two Service Structure halves were placed around the Soyuz to provide access to engineers. 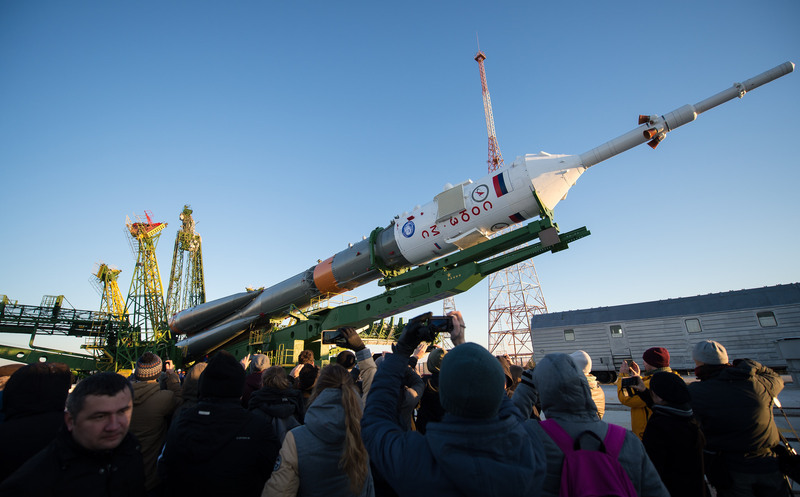 Over the next two days, Soyuz will be hooked up to electrical and propellant lines and a detailed testing campaign will follow to ensure all onboard systems are ready to support the mission. 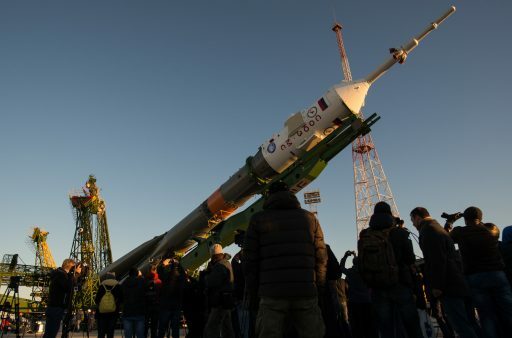 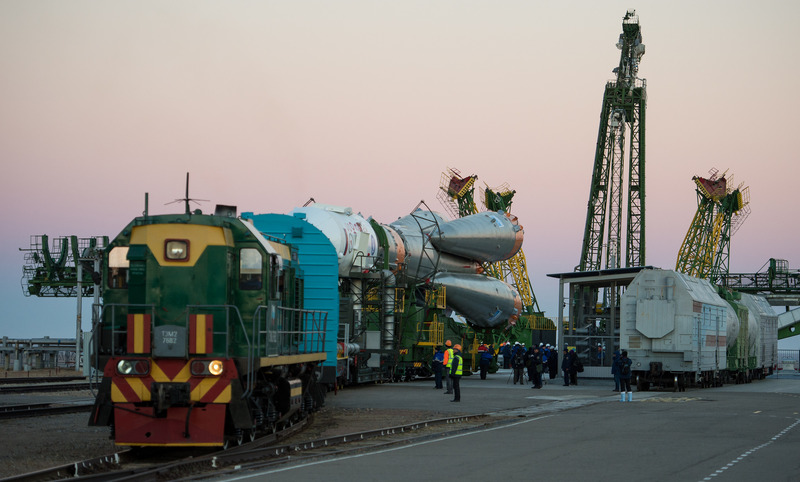 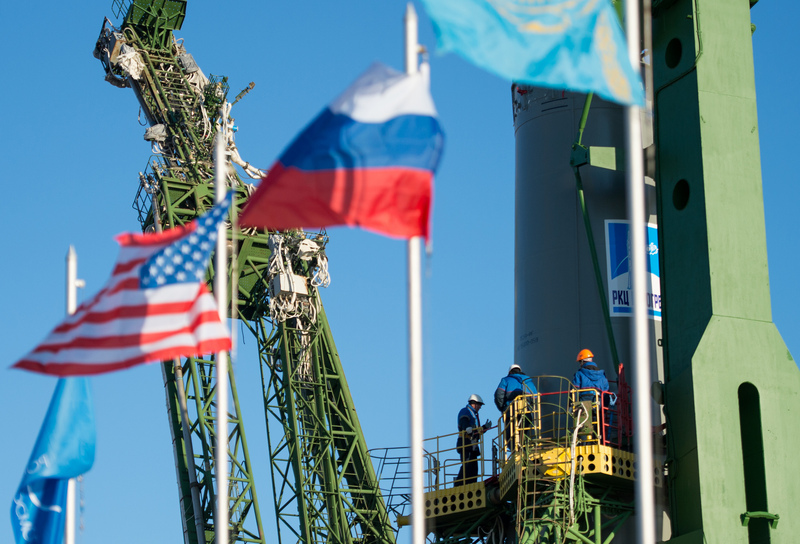 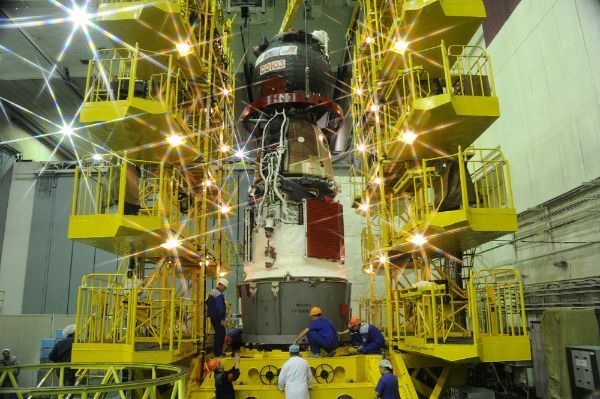 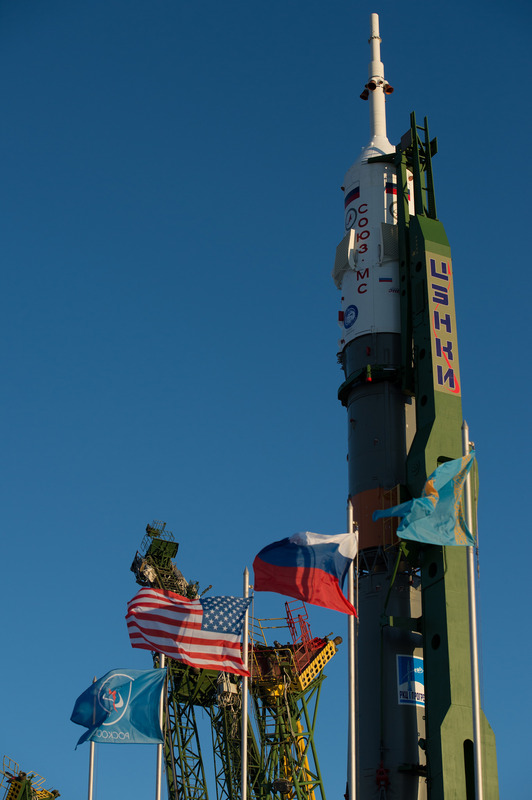 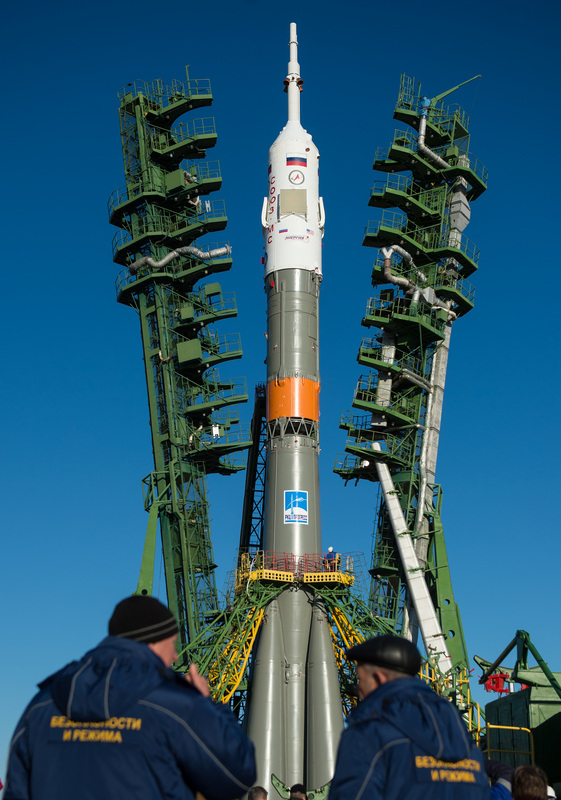 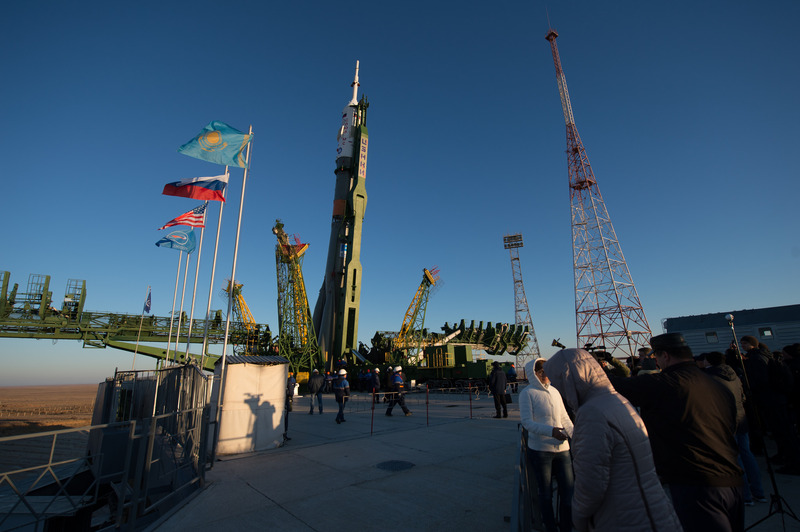 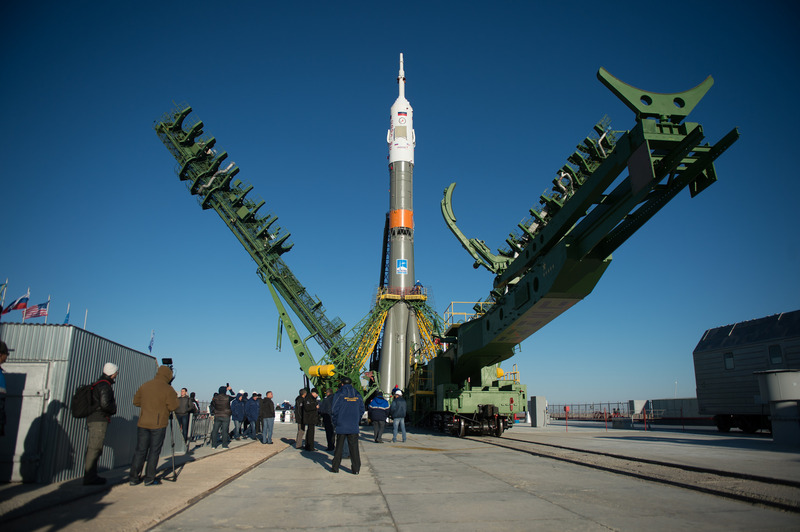 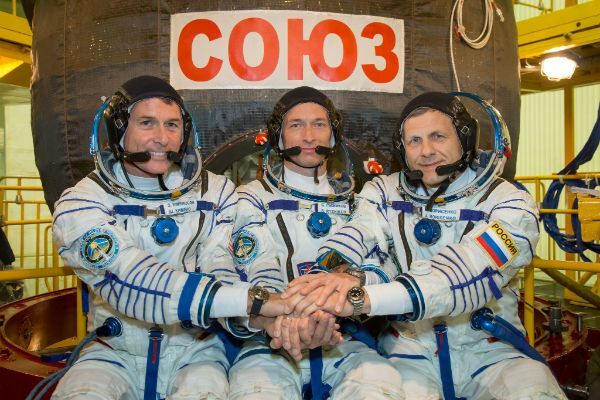 Soyuz will receive the traditional pre-flight blessing and teams will put in motion preparations for Wednesday’s eight-hour countdown sequence that will ready the rocket for propellant loading and the arrival of its crew to and a half hours prior to liftoff. 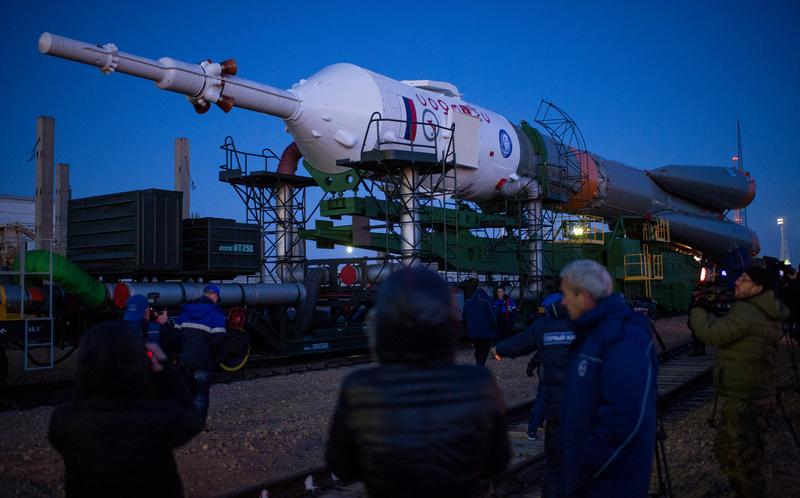 Rising from its pad under the loud thunder of its four boosters and core stage, Soyuz will head to the north-east to begin its chase of the Space Station. 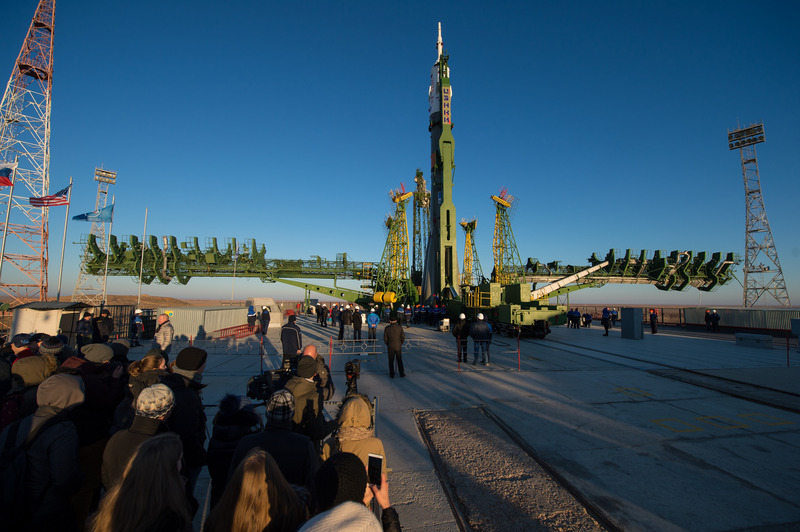 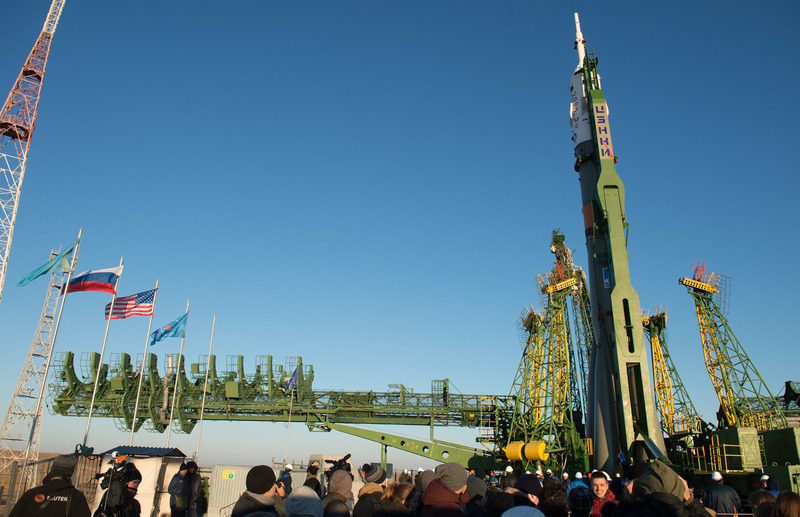 The crew will arrive in orbit less than nine minutes after liftoff, beginning a two-day link-up with ISS in order to complete testing of the new modified systems aboard the Soyuz MS vehicle. 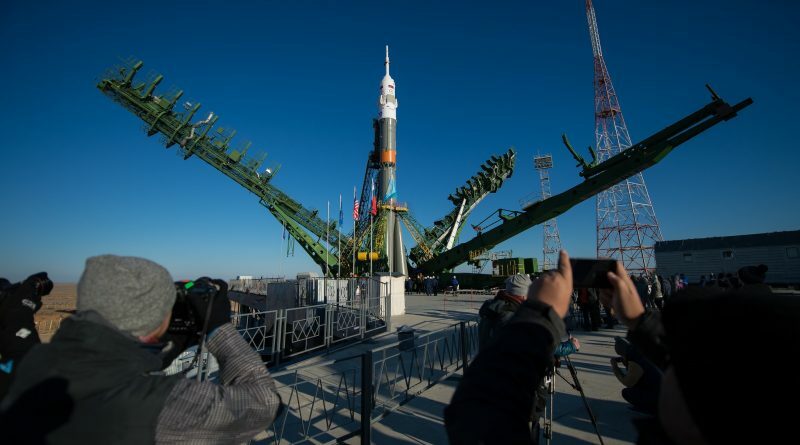 Docking is scheduled for 9:59 UTC on Friday, restoring the ISS crew to six for only a brief period as the resident station crew of Anatoli Ivanishin, Takuya Onishi and Kate Rubins is already in the midst of their preparations to return to Earth on October 30.